Learn general facts about the Rohingya. The Rohingya are a Muslim minority group from Burma, which Burma's government insists are from Bangladesh and has refused to recognize as citizens. 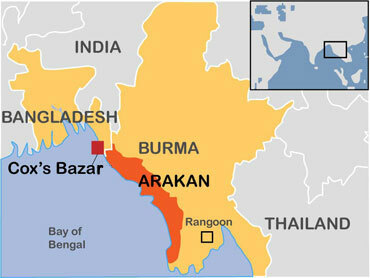 The Rohingya are Muslims native to the northern Arakan region of Burma, which borders Bangladesh. The name Rohingya is taken from "Rohang" or "Rohan," which was the name used for the Arakan region during the 9th and 10th centuries. According to Rohingya history, the group is descended from 7th century Arab, Mughal, and Bengali merchants who settled in Arakan territory. The Rohingya live alongside the Rakhine, a people descended from Hindus and Mongols who make up the ethnic majority in the region. The Rohingya language is known as Rohingyalish and is linguistically similar to the Chittagonian language spoken in the southernmost area of Bangladesh bordering Burma. While the language has been successfully written in scripts including Arabic, Hanafi, Urdu, and Burmese, the modern adaptation uses a script based on the 26 letters of the Roman alphabet with two additional Latin letters. The Rohingya were promised a separate Muslim state when the British reclaimed Burma from Japanese occupation during World War II as a reward for their loyalty. But instead, only those Rohingya that had collaborated with the British were appointed to official posts within the British-controlled colony. By 1947, the group had formed an army and had approached President Jinnah of newly-formed Pakistan to incorporate northern Arakan into a part of the country that would later form Bangladesh. Experts believe that it was this action that led to eventual problems between the Rohingya and the Burmese government, who saw the group as untrustworthy. When Burma declared independence in 1948, most Rohingya officials were replaced with Buddhist Arakanis who began to institute policies that many of the Muslim group considered unfair. Since that time, ethnic tensions have divided the two peoples. Prior to 1962 the Rohingya community was recognized as an indigenous ethnic nationality of Burma, with members of the group serving as representatives in the Burmese parliament, as well as ministers, parliamentary secretaries, and other high-ranking government positions. But since Burma’s military junta took control of the country in 1962, the Rohingya have been systematically deprived of their political rights. The Rohingya were declared “non-nationals” and “foreign residents,” according to a citizenship law established by the regime in 1982, and were denied the right to participate in multiparty elections held in 1990. The Rohingya have been subjected to large-scale ethnic cleansing following the formation of an independent Burma. Since 1948, nearly 1.5 million Rohingya have been forced to leave their homeland to avoid this persecution. Many members of the group have fled to Bangladesh, Pakistan, and Saudi Arabia, but others communities can be found in the U.A.E., Thailand, and Malaysia. Approximately 800,000 Rohingya still live inside Burma, while an estimated 600,000 live in Bangladesh, 250,000 live in Pakistan, and 300,000 live in Saudi Arabia. Around 100,000 other Rohingya make up parts of the population of the U.A.E., Thailand, and Malaysia. Communal violence between Rohingya and ethnic Buddhists in Burma’s Arakan state, also called Rakhine, in 2012 left more than 200 dead and tens of thousands homeless, with the Rohingya bearing the brunt of the violence. Deadly clashes erupted again two years later, prompting calls by rights groups and the United Nations for investigations into the unrest. Helped by human traffickers, hundreds of Rohingya meanwhile began to flee Burma by boat for Malaysia, Thailand, and Indonesia, leading to a surge of illegal migration by Rohingya and Bangladeshis in May 2015 that saw countries in the region turning vessels filled with hundreds if not thousands of sick and hungry passengers back at sea. It is standard practice throughout the world to grant citizenship to immigrants who assimilate and who learn the host county's language. The Rohingya have never done either. Although Burmese and Muslim groups distrust each other in Rakhine, this does not appear to apply in the rest of Myanmar where all religions are celebrated and respected and there is no friction. This suggests that in Rakhine, the problem is more about large numbers of muslims practising polygamy and pushing the indigenous population out. The rohingya is living in Myanmar from many years ago. They should be placed in Myanmar. Funny how Hindus complain when they are discriminated against as "British sponsored immigrants" in Guyana and Fiji but are OK with discrimination against Muslims in Myanmar. Rohingyas are settlers from south eastern Bangadesh. Their genetic code and language is true testimony. And these settlement is a continuous process right from the beginning of the last century. The problem is the overflowing population of Bangladesh. which is demographically affecting the Indian Provinces of Assam, Tripura and West Bengal also like it is affecting the Rakhine state. this is the only truth. Burma was one of the first countries to adopt the Universal Declaration of Human Rights. Unfortunately, the campaign of ethnic cleansing and now, outright genocide, being waged against the Rohingya by the Yangon government, is a crime against humanity that shocks the conscience of the world. There is no reason why these people should be excluded from full rights such as education and citizenship, just because they speak a different language (Rohingya) and practise a different religion (Sunni Islam with Sufist elements). It is outrageous discrimination and persecution of the worst kind and the criminal elements should be prosecuted in the International Criminal Court. Aung San Suu Kyi should be stripped of her Nobel Peace Prize as soon as possible. I urge all fair-minded people to donate to charities such as Médecins Sans Frontières (as I have done) to assist the hundreds of thousands of Rohingya refugees generated by the cruel actions of the Burmese government. This is a proof that the whole world is brainwashed by lies and fake news by main stream media funded by oil rich Muslim countries. These Bangalis are trying to take over land from native Rakhine people who are gradually displaced out in the last few decades. It is a simple logic for a sovereign government to prevent this happening. Your comments regarding Madam Aung San Suu Kyi are contemptible. The world thinks she has far more power than she actually holds. She is State Councillor for Health and Education and is doing all she can in those areas to make life better for all Burmese. If she supports the military, she loses her democratic party; if she speaks out against the military they can lock her up again. She should not have her Peace Prize taken away; she earned it. She is hamstrung now but has not remained silent as we are told. Go to You Tube and listen to her.